Police say Davis watched the train strike Han before leaving the subway station near Times Square. Davis has admitted to shoving Han, but says the victim had earlier grabbed his arm and threatened him. He told the New York Post in a jailhouse interview that he was coaxed into shoving Han by voices in his head that he didn't control. Davis is being held without bail and must return to court on Jan. 15. Davis is charged with intentional murder and murder through depraved indifference. He will be arraigned on January 15. 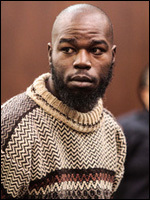 More here: Alleged Subway Shover Indicted in Death of Queens Father.